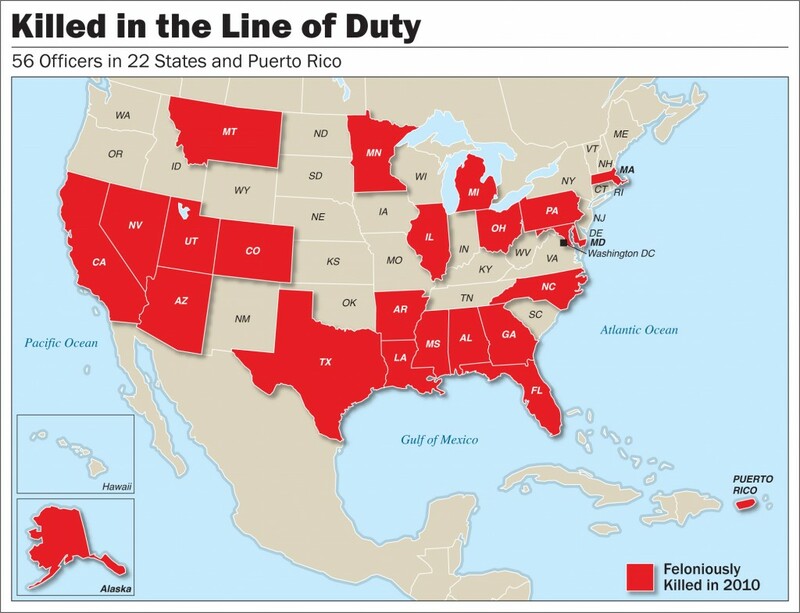 Fifty-six law enforcement officers in 22 states and Puerto Rico were “feloniously killed” in 2010, up from 48 the year before, the FBI reported. The annual Law Enforcement Officers Killed and Assaulted report released Monday also showed more than 53,000 officers were assaulted in 2010. An FBI press release summed up some of the shootings this way. Two West Memphis Police Department officers were killed during a traffic stop when a 16-year-old passenger exited the vehicle and opened fire with a semiautomatic rifle. A Chicago Police Department officer at the end of his shift was removing his gear near his car in the department’s parking lot when a man ambushed the 43-year-old officer and shot him with his own weapon. A 62-year-old deputy sheriff in Mississippi was shot and killed by an uncooperative suspect while responding to a domestic disturbance call. “Only when detectives, use-of-force investigators, supervisors and administrators examine the various components of the deadly mix will a greater understanding of these encounters emerge,” FBI researchers wrote in a study called Violent Encounters, an in-depth look at years of fatal altercations like those in today’s report. The 2010 report also shows 72 officers were accidently killed in the line of duty, almost all of them involving vehicles. All but one of the officers killed in a crime were shot. On was killed when a suspected used a car, the FBI said. A further breakdown shows 15 were ambushed, 14 were in arrest situations, seven were performing traffic stops, and six were answering disturbance calls. One in three officer assaults occurred while responding to disturbance calls, the FBI reported, and 14.7 percent occurred while officers were attempting arrests. The average age of officers killed feloniously was 38. Posted: 10/24/11 at 9:03 AM under FBI, News Story. Tags: FBI, feloniously killed, law enforcement, Puerto Rico, U.S.